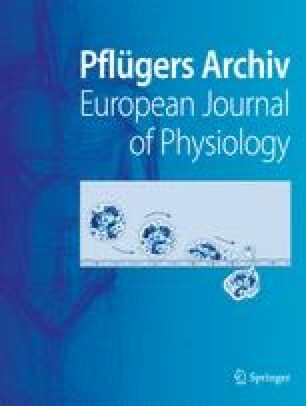 The influence of monoamine transmitter candidates, acetylcholine and related substances on rhythmic depolarization shifts (field bursts) in the CA1 area of hippocampal slices from rats in low calcium (0.2 mmol·l−1) high magnesium (4 mmol·l−1) was investigated. Acetylcholine (ACh), histamine (HA) and H2-agonists, noradrenaline (NA) and beta-agonists at nano- to micromolar concentrations as well as dopamine (DA) and 8-bromo-cyclic AMP at 100 μmol·l−1 accelerated the field bursts. H2-antagonists blocked HA actions, beta-antagonists blocked NA actions selectively; muscarinic antagonists blocked ACh, HA and NA actions. H1-agonists, serotonin, dopamine and adenosine slowed the field bursts at micromolar concentrations. These effects parallel the action of the tested substances on afterhyperpolarizations in CA 1 pyramidal cells. High sensitivity and specificity make this response of the field bursts an excellent model to study postsynaptic transmitter actions in the central nervous system.